Formalin preserved lamprey. Available in vacuum packs or pails. Petromyzon marinus. Representative of the Agnathans or jawless cartilaginous fish. Lampreys use their suction cup-like mouth to attach to their host and then rasp away the host fish’s skin to feed on its blood and bodily fluids. 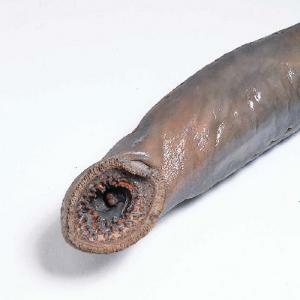 A major pest in the United States’ Great Lakes, lamprey have greatly depleted the populations of other fish. Chemical control of lamprey larvae has reduced their population to a tolerable level.